I sit here in the business class lounge on yet another trip to my Amsterdam office. I hear the heated conversation of a fellow business man on the phone with his wife arguing vehemently about him having to go to Amsterdam for work. He wholeheartedly puts forth that he has no choice and if he does not go, he will be fired. He goes on to say that he is going there for work and not “for fun”. But his wife is having none of it. She would rather give up their financial stability than risk her husband partying and/or being unfaithful to her. I do not know their situation. For all I know he could be a raging drug addict pervert who has hurt her many times before. That is not what this article is about. It is about the magnificent city that is Amsterdam. Everyone has preconceptions about this jewel of a city, but they are most likely vastly incomplete. Amsterdam is a treasure chest with no bottom! While it is true that prostitution and mild drug use are legal, it does not mean that those activities are the only reason to go there. Smoking is legal in the United States, but I’m not going to start smoking because I am there. These very same vices are accessible in regions around the globe with varying degrees of legality/enforcement. If someone is going to partake in those activities, they probably already have elsewhere. Additionally, if you have jealousy or sobriety worries for your spouse going places, then you have bigger issues than the trip at hand to deal with. Amsterdam is one of those picturesque places that is imagined but rarely exists for most of us. It is divided by manmade canals rather than just streets. These waterways are lined with tall, thin, beautifully architected buildings which used to be warehouses/houses for the traders from its shipping hay day. These houses now serve as residences and offices. The beauty is surreal and one can only imagine what it would be like living or working there. 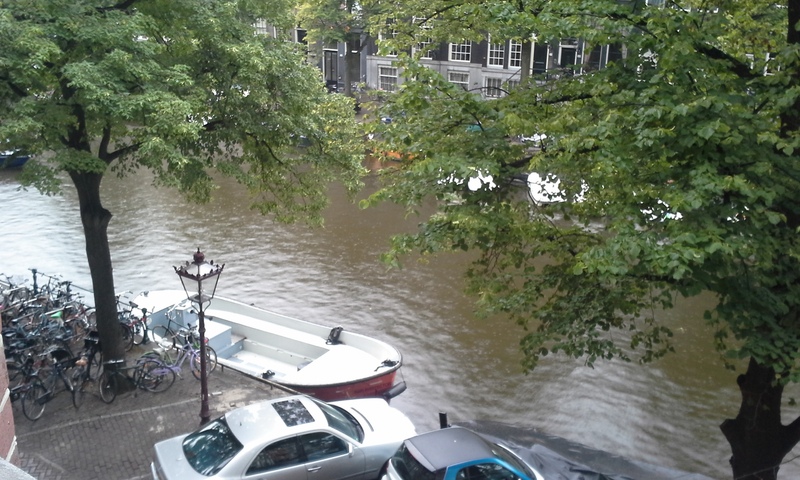 Allow me to brag a moment … it is truly breathtaking to be able to work from an office right on a canal. The fresh air gently blowing in while passenger boats float by with tourists or locals out for a day on the water … absolutely magical. I cannot stress this enough, Amsterdam is one of the best walking cities of the world! There is very little automobile traffic in the city center (Centrum). Commuters and locals take well thought out trolleys throughout the city, but they are not overwhelming. That leaves room for pedestrians and bicycles … oh there are bicycles … everywhere! (Note: Bicycles and cars/buses have right of way. So stay alert!) As one walks, there are major roadways and tiny alleyways each hosting unique treasures. These routes are lined with small and unique shops and businesses. One can enjoyably get lost searching for what amazing thing lies around the next corner. Hint: If you have a Smartphone, turn on your GPS and add your hotel or specific other destination to your favorites and NEVER get lost!!! Amsterdam is that small and easy to navigate. 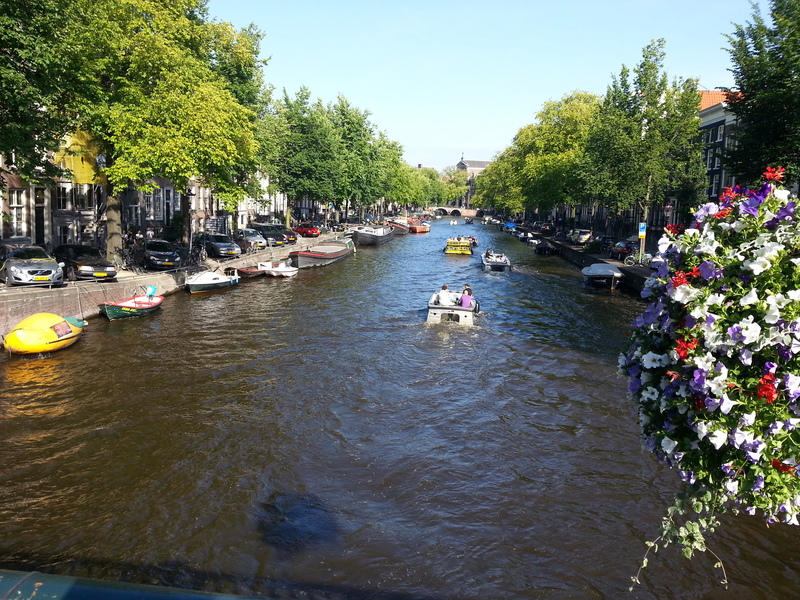 The Dutch people … what an amazing culture! Due to Amsterdam’s status as a premier tourist destination, everyone I met was friendly, warm and welcoming. As with most European metropolitan areas, the people speak many other languages besides their own … and well too. You will have little trouble speaking with the locals. As a matter of fact, you should engage them as much as possible. Everyone has an interesting story or viewpoint and they are eager to hear yours. So, what do you like to do? Arts and culture? Amsterdam has some of the finest and most unique museums. They have it all, from Van Gogh to Medieval Torture. Are you a foodie? Because the Dutch have a history of world exploration, they import everything and with that comes an eclectic mix of world cuisines. Fancy Tibetan? They got it. Argentinean steaks? Yup! American fast food? Unfortunately yes to that too. 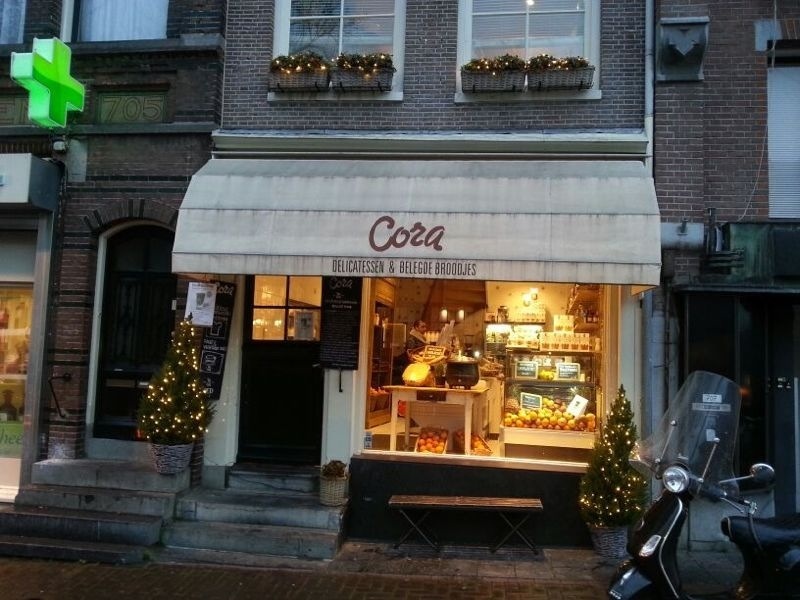 I had one of the best and most unique sandwiches from an Italian sandwich shop called Cora Broodjes (Cora Sandwiches – http://www.cora-broodjes.nl/) on Prinsengracht. Do you like to party? Amsterdam’s got an amazing nightlife. And they really aren’t serving coffee as the top item in those coffee shops. Europeans are well aware of the lure of Amsterdam. Some fly in, party all night without sleep and then catch a flight back home the next day … yeah it’s that kind of city! Do you like the water? 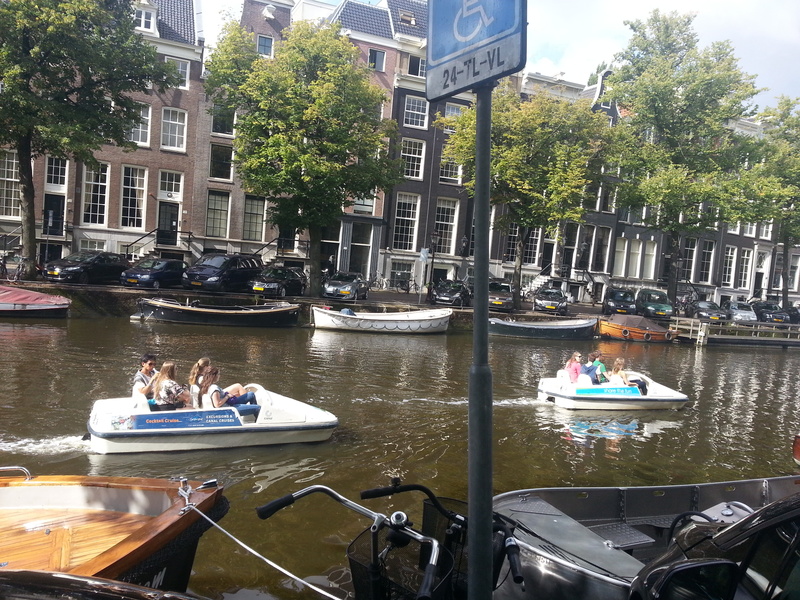 Rent a paddle boat (or bike boat) and cruise the canals at your own pace. Want a guided tour, get on a canal tour boat and navigate the waterways learning all about what made Amsterdam a jewel in Europe’s crown. While the tourists are indulging themselves in anything they could imagine, the local population operates right along side as if the rest does not exist. Parents with front and rear bicycle baby seats peddle along cobblestone streets. Women with skirts and high heals peddle their bikes with a style and grace that they must be born with. Business people zipping along in trolley cars heading to their next appointment. Old and young couples strolling the canals hand in hand without a care in the world. Yeah, the locals know how good they’ve got it. Is Amsterdam wooden clogs and tulips? Yes. Is it tall thin row houses and canals? Yes. Is it prostitutes and drugs? Yes. Is it bicycles and boats? Yes. Amsterdam is all of this and so much more! It is a safe, friendly, beautiful, historic city that everyone should come, explore and discover what Amsterdam is to them. 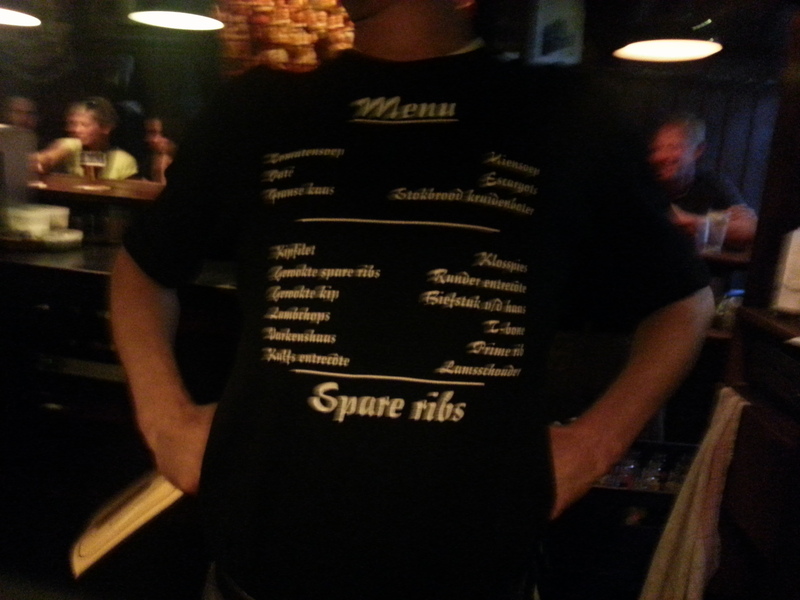 Travel Note: If you want REALLY good beef ribs in an old world super friendly atmosphere, get yourself to Café de Klos (Kerkstraat 41-43). There is usually a long wait for the few tables that they have there, but no worries . . . they own the bar across the street and you can hang out over there for some drinks and appetizers while you wait. If you want to cut down the wait time, ask to sit at the bar instead of a table (for some reason, there is more bar space than table space). The staff is hysterical and will make fun of themselves and you in a heartbeat, so don’t go there if you are of the faint of heart. But if you play along, you will become a regular in their eyes and will have an awesome time. Need a menu, just call the bartender over . . . it’s on their shirts! If you go, ask for Marik (aka Mark – looks like Kiefer Sutherland) and tell him Superman sent you. Make your own judgments about Amsterdam. Get around by walking or renting a bike. Use the GPS/Maps feature on your Smartphone. Get outside of your comfort zone and try something new.